Rihanna’s Anti went platinum in 15 hours. But before you think, “albums are back!” bear in mind a big caveat: Samsung bought one million copies of the album and gave them away. For Rihanna and Samsung, Anti going platinum is not about record sales — it’s about creating a moment that earns attention for two giant brands at a time when attention is currency, as Brian Solis has noted. There are many more moments to come, as prepares to launch her Anti World Tour, where the real money will be made. A platinum album is certified by the Recording Industry Association of America (RIAA) as selling at least one million copies — a difficult feat to achieve in the digital age. Only three albums released in 2015 went platinum: Adele’s 25; Drake’s If You’re Reading This, It’s Too Late; and Justin Bieber’s Purpose. Adele, Drake, and Justin Bieber all earned their sales the traditional way: by releasing and promoting music for consumers to buy, stream, and download (with the exception of 25). But Rihanna rolls differently. In 2015, she signed a $25 million deal with Samsung, through which Samsung sponsors her album and tour, and Rihanna promotes Samsung’s Galaxy line of products. As part of their relationship, Rihanna and Samsung have been creating digital content together including video, website, and social media posts. Oh, and Samsung agreed to buy 1 million copies of Anti. Samsung, in turn, gave away 1 million free download codes to its customers. Each of those downloads came with a 60-day free trial to Tidal, the high-end streaming service that counts Rihanna as one of its owners. The entire album was available on Tidal before any other streaming service could have access to it. In effect, Samsung has acted as a music promoter and distributer, a common role for brands to play as artists find new ways to share their music amid the converging worlds of music, technology, and branding. Samsung has played this role before. In 2013, Samsung bought one million copies of Jay Z’s Magna Carta Holy Grail and distributed the album through a special app before Maga Carta Holy Grail went on sale. Samsung reportedly paid $5 for every album, meaning Magna Carta Holy Grail sold $5 million before a consumer purchased a single copy. At the time, the RIAA was inspired to change the way it tracks the sale of digital albums to account for the 1 million units sold instantly. Rihanna. She has a platinum album out of the gate, even if Billboard doesn’t certify it officially as such. And as Tidal co-owner, she benefits from any boost in subscribership that Tidal receives from the Samsung promotion. More importantly, though, the buzz created by Anti will build fan excitement for her 68-date Anti world tour, which kicks off February 26. For the world’s wealthiest musicians, the big money comes from touring, not recording, as opposed to the era when tours supported albums. But with the exception of baby boomer acts like the Rolling Stones, artists need new music to keep their tours fresh and their names visible. 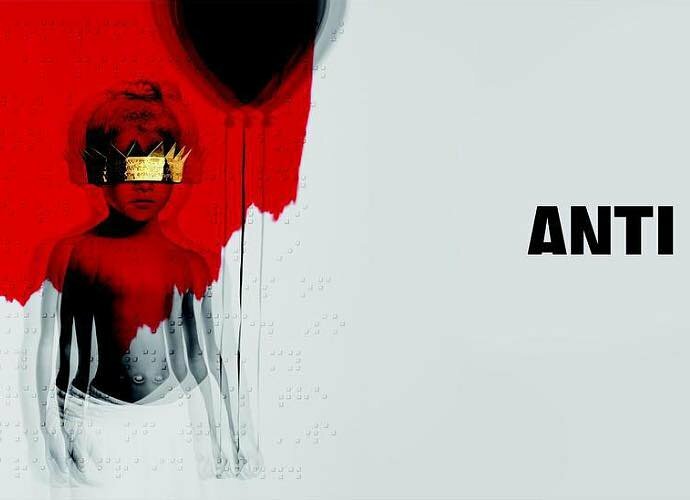 Anti gives Rihanna newly minted branded content to fuel her tour. As Katy Perry, the highest-earning musician of 2015, told Forbes, “The record is that launching pad for all kinds of other creative branches.” Anti is a major launching pad. Samsung. 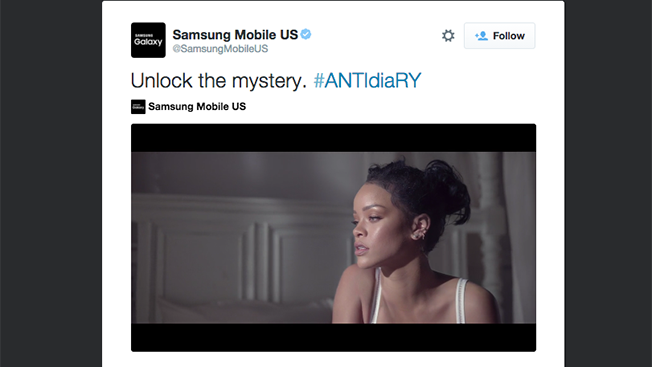 Rihanna uses her reach to hustle the Samsung name. She hawks Samsung phones in ads and talks about Samsung to the millions of fans who follow her across social media channels. And Samsung gets to remind everyone that it’s the anti-Apple, working with millennial-friendly badass artists while Apple stays in bed with aging rock stars and fumbles its own attempt to play music distributor. Jay Z. As noted, his Roc Nation management company (which he founded in 2008) also acts as the record label for Anti. Roc Nation is an intriguing multimedia company involved in sports, music, and live entertainment, including a partnership with Live Nation that will no doubt benefit from Rihanna’s 68-show Anti World Tour, which kicks off February 26 (sponsored by Samsung). Rihanna, Jay Z, and J. Cole are the biggest names on the Roc Nation record label — and Rihanna’s going to be the biggest cash machine in 2016. Tidal. Getting Anti before any other streaming service is a huge coup for Tidal, which needs a shot in the arm. According to Tidal, Anti was streamed 13 million times in 14 hours. Tidal, reportedly struggling and looking for buyers, needs more deals like this one to give listeners a reason to choose a premium streaming service over more established competitors such as Spotify and Pandora. Samsung has an uncanny knack for creating great content-driven moments that earn our attention, including the behind-the-scenes engineering of the most popular selfie of all time, courtesy of Ellen DeGeneres and the 2014 Academy Awards. So far, Samsung’s relationship with Rihanna has relied on the creation of visual moments (such as with an Instagram account) and a gaming experience available through an app. The next frontier for Samsung and Rihanna will occur during the Anti, where the two brands will have 68 opportunities to create many more moments. The two might want to borrow a page from Lady Gaga and Virgin Mobile USA. In 2011, Lady Gaga and Virgin engineered a promotion through which Lady Gaga called fans from onstage using a Virgin Mobile USA phone. And during Lady Gaga’s 2013 Born This Way Tour, Lady Gaga and Virgin Mobile USA partnered to engage fans and raise awareness for youth homelessness through an inspired campaign that relied heavily on social media. Rihanna and Samsung are moving a lot of music together and creating some interesting content. They have earned our attention. But attention can be lost easily, especially in our multi-tasking, multi-media world in which snaps, tweets, Facebook posts, videos, and Instagram moments are, at best, fleeting impressions. To turn attention into sustained engagement and interest, Rihanna and Samsung will need to create more moments together — including mobile “micro-moments,” which Google defines as times when people use their mobile phones to decide what to do, where to go, and what to buy. I expect the Anti tour will be the launching pad for those moments — and we will get a taste of what’s to come when she performs at Super Bowl 50 February 7. This entry was posted in Marketing and tagged Anti, Brian Solis, David Deal, Deerhunter, iCrossing, Jay-Z, Jermaine Dupri, Lady Gaga, OK Go, Rihanna, Roc Nation, Samsung, Superhype, Tidal. Bookmark the permalink. I agree — it sure looks like a win/win to me. I feel like they are just getting warmed up, too.